THANKS TO EVERYONE FOR ALL THE ENCOURAGING COMMENTS AND FAVING OF THIS PIECE. YOU PEOPLE ARE THE BEST!!! The 90's live action movies,all of the amazing artwork I've seen by concept artists around the world. They have achieved and unseen level of deepness and realism. SO I went for that approach. The beaten look came really for my taste for worn out, hurt, scared, ground level, compromised kinda thing. A toast to Kevin Eastman & Peter Laird, for they have created some of the most exciting characters of modern times. - Soundtrack Recomended: Jin-Go-Lo-Ba by Santana Blues Band 1969. Lots of raw power. Look for it people!!! Hello, thank you for creating this image. I made my own poster of it and used it as artwork on an arcade cabinet. I love this illustration & I'm sorry to say but, I own a print of this. I think I have enough TMNT art to fill a large room. mate // this is MORE THAN EPIC !!! Whoaaaa! dude you have some killer habilities and badass vision, I´m loving it. They are all great pieces and I can really apretiate all the work you´ve put into them. Dark and girtty. Amazing ciaroscuro. You could beneffit from some "from life" drawing classes. Human anatomy and stuff. Overall I was amazed by your Ralph redention, man it´s s cool it almost make feel like coloring it. See you arond and keep send your art my way! Amazing. Looks like you could touch him. awesome and he is my favorite one!! that drawing rocks,do you like the teenage mutant ninja turtles?if you do can you send me your drawings. I do love them, and well I cannot send them to you, but you can still look at them at my gallery. Love it that u love it GRACIAS! EVer wonder what my redention of Donnie would sound like?? You were the first artist I ever gave a comment to way back when I created my DA account; I got a new computer and needed a good wallpaper, and this one absolutely took my breath away. Since then, I've been through many different wallpaper themes, but every so often, I come back to this one. It's on my desktop again, and shall remain for a while. I still can't say enough about this picture man, the details on his chest, the scars, the bullet wound, the look on his face. It's everything I want in the Ninja Turtles. I realize this is a once in a lifetime piece, and I couldn't ask anyone to recreate it, but I can't imagine how amazing a full set of turtles artwork would be with this style. Have you ever considered it? I mean, making a similar wallpapers for the other three turtles, all with the same detail and atmosphere, each with their respective background coloring. I'm sure that I am not the only person ever to ask you that, and in fact, I'm sure you get it a lot. I understand it's most likely not in the works, and that's no problem at all man, I'm happy to just have this one. But if it ever did come to fruition, man; I'd love to see all four turtles prints on my wall lol. Anyway, this love note has gone on long enough, so I'll sum it up: Thanks again man, absolutely fantastic piece. Hey there, wow I really aprettiate the way you took your time to speak out your mind. Looking at the date it was a day prior to my 34 bthday last year. I guess I was a bit down then. STill my whole TMNT set of wallpapers is available for you, and it stands as my highest point up until now. I´m really looking forward to go back to them turtles in a bolder, meaner way, but I´m still working on my confidence. Thanks again for your encouraging and inspiring works, and please take a look at the rest of my TMNT WP´s. Wow! 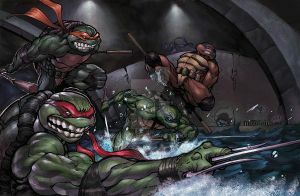 This is the best TMNT art I've seen so far... great job sir! I'd wanna see the Leo one like this ('cause he's my fave). thats the only thing i can think about, when i see this pic. probably the best pic of one of the turtles..
and i really dont play ! WOw I had lost track of it, that's sweet. THANKS!!! jaw drop...Man, that is amazing, astounding, I don't have words to describe how wonderful this piece is! If Donny could speak, I'm sure he'd be giving you a million thanks for this masterpiece. Since he can't, though, I'll have to do it for him. You're awesome, dude. Hey that´s neat, he propably spoke to me one way or the other when I first rendered him. THNX!! !